@Tuttle, sorry about that had 2 lightbox packages installed when doing some testing. Hi ! This tutorial is really useful, I was able to set up a little gallery. Now, when I open the lightboxes, under the pictures there are 3 rows of text : View image details / Download original and Image x of n. How can I remove those 3 lines and just put the title instead ? Af for the the border around the thumbnails, I read below that it has to be done through CSS, no other way at all ? @DADAMO, Yes the borders have to be done in CSS. As for the text in the lightbox, normal users won't see the View image details / Download original image if they haven't got permissions. With Drupal it is a good idea to have 2 seperate browsers with one of them acting as an anonymous user so you can see how most people will see the site. You may want to try Shadowbox rather than Lightbox2 as it has less information and would fit with your theme a bit better. Alright, I'll try that ! Alright, I'll try that ! Thanks a lot for yur help ! The lightbox just shows the images of the current page, not the whole gallery. Any was around this? @Tuttle, Not unless you change the view to allow all the images to show. I was refering to your example page. Is there a way to use a pager on the page, but show all images in the lightbox slideshow? @Tuttle, that is what I meant, I don't think you can have all the images appear in the lightbox slideshow without the images being on the page to start off with which means the pager would have to disappear. I am sure there probably is a way around it, but not easily within Views. Hello and thanks you a million for posting a tutorial to help people. Sorry to say though, but it's two thumbs down from me. If so many people have the problem, please remove and/or update your tutorial until it's sorted out and it doesn't keep happening to so many people. It could possibly be more unhelpful than helpful at the moment. @Gary, The tutorial works for the vast majority of people. The reason it doesn't work for you and some of the others will be down to your webserver/drupal configuration. The fact the images don't show even on the individual pages then it is likely imagecache isn't working properly. I imagine your files folder isn't fully writable. Are the images created? I followed the information here to customize CCK for a header Image rotator. Great tutorial. Thanks for sharing you info and technique. Got it up and running in no time. Thanks James. For people who can't see an image thumbnail. Most likely cause is that Imagecache is not working. Most common reason for Imagecache not working is that 'Clean URLs' are not enabled. IMPORTANT: for this technique to work, 'Clean URLs' needs to be on (or imagecache won't work, and the gallery won't work). Brillaint! @Glenn, thanks for that, didn't realise Imagecache required Clean URLs. I imagine that will sort out a few people. Thanks Gary, followed your instructions and it works great! I'm stuck a little early on. When I attempt to add the field type of image and from the data type drop down menu I select file and widget type just says "file upload" not image. @bradleyh10, Have you enabled the imagefield module? firstly let me thank you for the great tutorial. Everything works out perfectly. However, when I log out and try to view my gallery as non registered viewer, no pictures appear (The Gallery, called Berlin, appears, just the pictures are not shown). @peter, make sure that anonymous users have permission to view the different imagecache presets. DO you have a quick fix for the gallery..
ooops, I have installed Gallery everything works fine, only that I also have the "wibiya toolbar" and the lightbox stops working. I know that both modules work on lightbox.. not sure if #1 or #2 .. I have turned of the social connection module (wibiya) and it works perfect! hi, i have followed all the steps and added 2 images. Also when i view the gallery, thumbnails are not shown but the links are and if clicked they show the images on a new page. @samdcruz, You will need to set up your view properly. I would suggest you read through the tutorial again and follow it step by step. You also need to enable Clean URLs for ImageCache to work. thanks, however it will not allow me to enable clean urls. "Your system configuration does not currently support this feature. The handbook page on Clean URLs has additional troubleshooting information." I have read the drupal help and have modified the .htaccess file but it still does not allow me. any idea what to do or what code will work in the .htaccess ? I made all the steps, but shows my 6 images in 1 column, and I choosed horizontal in grid :( Why this? @Kirari, I don't know I never chose horizontal in grid selection. Is there any reason you have? Really nice tutorial. I see you have made two tutorials, Gallery and Albums. What is the difference between Gallery and Album? I'm trying to add images to my blog entries. So, is my blog items = album? On my main pag, I would like to have a link to my highest rated images. = Gallery? Neither would be suitable for what you want by the sounds of it. 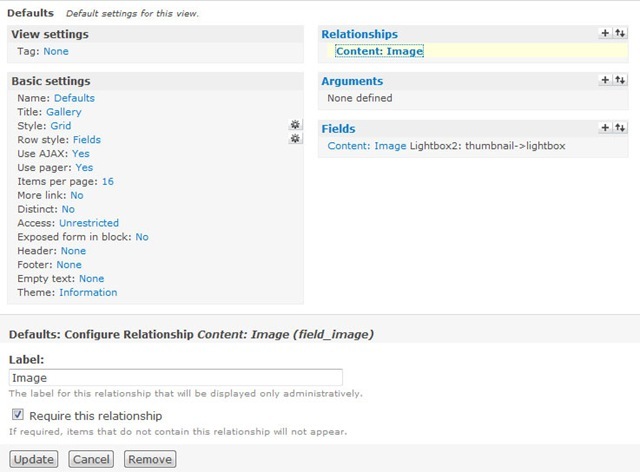 All you need is the imagefield on your blog content type and set up a view pulling out the images. Not sure how you would do rating of an image within a blog post though. Those struggling with getting the images to appear need to go to the permissions page and look for content_permissions module. Tick the boxes for view field_image (or whatever you named it) and the images will appear. Make sure the other permissions for Lightbox and Imagecache are ticked as well. I have follow it your procedure, but it is doesn't show it for the picture , just show it about node published ,why?? is there anyone can help me to do that? Make sure you have clean URLs enabled and that the permissions are set up correctly to allow users to view images. thanks sir it is work now ,but now I have a problem with the lightbox 2, after I enabled the module in drupal, it cann't show for the lightbox, I confused it , and the format I have changed it, to lightbox 2-->thumbnail-->lightbox, but it cann't show the picture and the lightbox, and If I changed the format to image links to node, it can show the picture,now what must I do? You will have to check to make sure the lightbox is being included in the HTML and that all users have permission to view imagecache images. Best to ask the creator of the theme if they have allowed any implementations. You could use the nice menus module. can delete the LETTER PRIMARY LINKS in my menus sir? I don't use nice_menu module, put an issue in with the author. I also followed this and did not get any images on my page. I checked the source code and when hovering over the in firebug, it would not load so I checked the path and the folder for "thumbnail" that we created in the Imagecache step was not there. I'm wondering if it was created somewhere else? I'm on a localhost and it won't let me enable clean URLs. Is this the problem? Once I created the folder myself and added the picture, the image loaded on the page, but it was not cropped and scaled. You must have Clean URLs enabled for the imagecache module to work. I also followed this and did not get any images on my page. At the time of attaching a image to the node itself, the image was not shown. It only had shown a thumbnail, but when i tried to preview it or save it, the node was blank. it had no images and so the view also could not retrieve the image. What is the problem admin??? My cleanurl is enabled and i'm working on a localhost. Moreover, i noticed that the images are coded to be retrieved from sites\default\files\imagecache\thumbnails and lightbox but there are no images there. Instead the lightbox images are saved, to “sites\default\files” and the thumbnails to "sites\default\files\imagefield_thumbs"
I have done things right but i don't know about the problem. Please help sir. Make sure the files directory is writable. I don't see the label. Have you sorted it? If not, it may be some debug or cached view you are seeing. I'm noticing the tage Image: infront of all my pictures when I browse to www.thunderpunch.net/gallery but when I edit the view the preview does not show these labels. If I go under fields and change the label to widgit default: image then it shows up under the preview. Any ideas? I think it is necessery to correct an error in this bundle of modules. 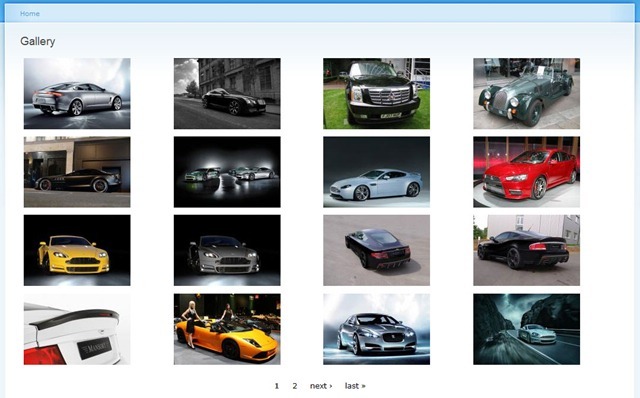 installation on native drupal runs without problems, the path to the images-thumbnails created, but on fact such images on the server like the folder structure does not exist. when resized thumbnails, even if the folder structure was created, it is removed. rights to "files" were exhibited and 775 and 777. Sorry for my English. An excellent and clear tutorial. I've followed it to the letter up to the adding of a View (as a node). "Set the title to Gallery. For Style set to Grid then chose 4 columns and set Alignment to Horizontal." The Views page offers only the one choice given for each of these options, and no means or method to change them. Nor can I change Filter as you tutorial goes on to suggest. Is this a modules version issue? Or is there some setting in Views I am overlooking? First of all, thanks for a great tutorial. It has really helped me move forward immeasurably. Second, in my gallery, I have set up Views exactly as you did and have gone back to re-check about ten times. The images in the gallery are appearing in duplicate and in a vertical column even though I have set everything to horizontal as you have in the tutorial. I read many tutorials on gallery's and they always seem so overly complicated with views and cck fields. I found the best way is to use just the TinyMCE, IMCE and Lightbox2 modules.